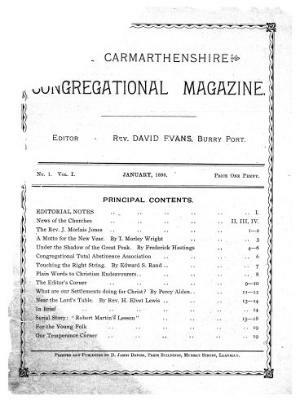 A monthly religious periodical that served the Congregationalist denomination in Carmarthenshire and West Glamorgan. The periodical was edited by David Evans, Iona M. Williams and William Phillips. The Congregationalist Magazine was issue as a supplement with the periodical. Associated Titles: The Carmarthenshire and West Glamorganshire Congregational Magazine (1903); The Congregational Magazine (1896).